In honor of National Burger Month, we decided to find the best, juiciest burgers in the country. Our friends at Foursquare dug through their troves of user data to compile the list. Because the site now allows users to save and favorite venues they love, Foursquare was able to track down which burgers diners are raving about most across America. “Classic American comfort food, beers, and milkshakes are a recipe to ensure your solo dining adventure is one that will probably lull you into a lovely food coma,” The Village Voice wrote in a review on Foursquare. The restaurant bills itself as the “ultimate burger experience and more.” Besides an extensive build your own burger menu, the restaurant also offers a wide selection of chef’s burgers, such as the Hubert Keller burger (pictured here), which comes on ciabatta with blue cheese, caramelized onions, and and baby spinach. Reviewers rave about the options for customizing your own burger at The Counter. It’s great for both picky eaters and vegetarians. “This is the ORIGINAL best burger in town. Grab a beer, throw a buck in one of the best juke boxes in town, and enjoy one of the best dive bars in Austin,” wrote Foursquare user AGVSM. Burger and Barrel’s bash burger (pictured here) has won numerous awards and is a customer favorite. The patty is topped with onion and bacon jam, American cheese, and pickles, then sandwiched in between a brioche bun and a fried onion ring. If you’re looking for a trendy burger, look no further than Umami Burger. Even though the chain started in LA, it’s the New York joint that made this list. From the U stamped on the top of the bun to the truffle featured prominently in their menu, Umami is a step above your average hole-in-the-wall burger joint. Gott’s rethinks classic dinner food and adds a twist (i.e. the ahi tuna burger). It boasts locally-sourced ingredients and organic beef. “The hamburger at DuMont Restaurant in Williamsburg, Brooklyn — foodie central in recent years — was so good they opened a dedicated shop cross town named after the dish,” Epicurious wrote in a review on Foursquare. “Meat-on-meat burgers called stackers — with short ribs, pulled pork or prosciutto piled on top of the beef patty — are the ultimate indulgence for carnivores at this eatery,” Redeye Chicago wrote in a review on Foursquare. No matter how weird it sounds, Yo Mama’s peanut butter bacon burger gets rave reviews. Burgers are also served with a loaded baked potato instead of fries, so save room for some of both. There are two favorites at PYT: the boozy adult milkshakes, and the doh! nut burger. A patty topped with chocolate covered bacon and sandwiched in between a glazed donut, the doh! nut is a caloric combination of savory and sweet. The prez Obama burger with applewood bacon, onion marmalade, Roquefort cheese, and horseradish mayo is a top pick, along with the toasted marshmallow milkshake. The Corner Bistro refers to itself as “the last of the bohemian bars in west Greenwich Village,” and claims that its ambience remains unchanged since it first opened in the earlier part of this century. They don’t accept cards, so be sure to have some cash on you. The original eponymous 5 Napkin Burger (pictured here) comes highly recommended. The fries also get high ratings, as well as other menu items such as the Kobe beef foot long hot dog. “Best burger in Philly hands down. Decadence at its finest. Foie gras, truffled mushrooms, bleu cheese, fried egg, and bacon. Bring on the heart attack,” wrote Foursquare user Patrick W.
An old-fashioned cash-only diner that’s been around since 1947, Apple Pan serves up classics such as the steak burger and banana cream pie. “This spot’s burgers, with their perfect ratio of meat to bread and cheddar cheese, continually rank among the best in the Bay Area. Enjoy one and watch the world go by,” Eater wrote in a review on Foursquare. Known as the “Cadillac of burgers” P.J. Clarke’s has been serving “the famous and the infamous” since 1884. Past customers include Buddy Holly, Frank Sinatra, and Nat King Cole. “It’s a half pound burger with a baked potato on the side, it’s great!! If you like your burger rare, they’ll make one that practically moos,” wrote Foursquare user Candace Williams. Hidden inside the upscale Le Parker Meridien hotel, Burger Joint is no frills and cash only. Customers describe the burgers as perfect — not too big and not too small. Known for their Bloody Marys, Sobelman’s was started by a couple — with high school educations and no culinary experience — who met in a restaurant. Just like their crazy Bloody Mary garnishes, their burgers are unusual and over-the-top. Featuring burgers made from all different kinds of meat — lamb, chicken, bison — Abbey is great for those looking to try a more exotic burger. “The burgers are delicious and the hand-battered onion rings dipped in the Yeah! Sauce help make this one of the best places to hit on those days you just want to be bad,” 360 Media wrote in a review on Foursquare. The two favorite menu items at Holstein’s are the rising sun (pictured here) and the gold standard. Complete with Kobe beef, Teriyaki glaze, crispy yam, spicy mayo, and tempura avocado, the rising sun is almost a cross between burger and sushi. “This Harvard mainstay is only getting better with age. Their constant inventiveness with topping combos (along with hilarious names!) for their burgers is unmatched by any other joint in the area. A+!” wrote Foursquare user Nicholas Woolf. Great for dinner before heading out or a late-night snack on your way home from the bar, the signature Office Burger at Father’s Office lives up to the hype. 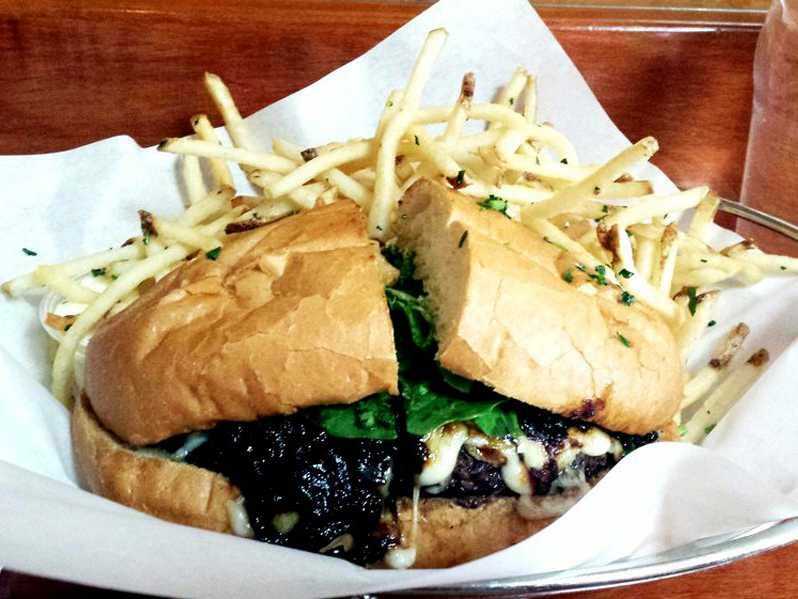 Topped with caramelized onions, arugula, gruyere, and blue cheese, it’s sure to satisfy your burger craving to matter what time it is. Burgers sit front and center at Grindhouse Killer Burgers, where diners can customize their patty from over 20 ingredients and add-ons, or choose from one of the restaurant’s signature combinations. The highly-rated Apache style burger comes topped with pepper jack cheese, grilled onions, and green chilies. “Gordo didn’t disappoint me one bit. The Hell’s Kitchen and Farm burgers were innovative and tasty. Powdered sugar on sweet potato fries — why don’t more people do this?! Definitely worth revisiting,” wrote Foursquare user DJ Rydeen. From a raw tuna tartare patty with Asian pear and wasabi mayo to a blackened shrimp patty with tempura fried lemon, creativity defines FLiP’s not-so-classic burgers. Save room for one of their award-winning milkshakes as well, in flavors such as foie gras or Cap’n Crunch. Burgers get the upscale treatment at The Breslin Bar & Dining Room, where the lamb burger comes topped with feta and cumin mayo. It’s a can’t-miss, trust us. All of the ingredients used at Roam Artisan Burgers are sustainably sourced, so you can feel good about what you’re eating, whether it’s a free-range turkey burger topped with BBQ sauce or an organic veggie burger covered in aged white cheddar. Tasty Burger’s name doesn’t lie — their juicy burgers always hit the spot, whether you’re catching a game at Fenway, picnicking in the park, or stumbling in for a late-night bite. “Heavy metal: check. Bigger than life burgers: check. Beers and bourbon: check. What else can you ask for? Do your ears, throat, and stomach a favor and visit this place,” wrote Foursquare user Alexandros Plexidos. Great music and even better burgers go hand in hand at Burger & Beer Joint, where each of the restaurant’s signature burgers are named after famous rock songs. Fan favorites include the “Hotel California,” topped with guacamole and a fried egg, or the “Stairway to Heaven” with foie gras and black truffle aioli. When there’s an entire section of the menu dedicated to “bypass burgers,” you know you’re in for some serious beef. The signature Coronary Bypass burger comes complete with a half-pound of meat, fried egg, three slices of cheese, and four slices of bacon. What’s your number? Whether it’s a No. 1 (aged cheddar and smoked bacon), a No. 14 (fresh salmon with red Thai curry sauce), or somewhere in between, you can’t go wrong with any of DMK Burger Bar’s mouthwatering creations. Be sure to save room for their Parmesan truffle fries as well. “With a solid selection of wursts, a rotating selection of beers on tap, old-school house-made sodas and floats, and a great outdoor space, The Pharmacy does it right,” Eater wrote in a review on Foursquare. 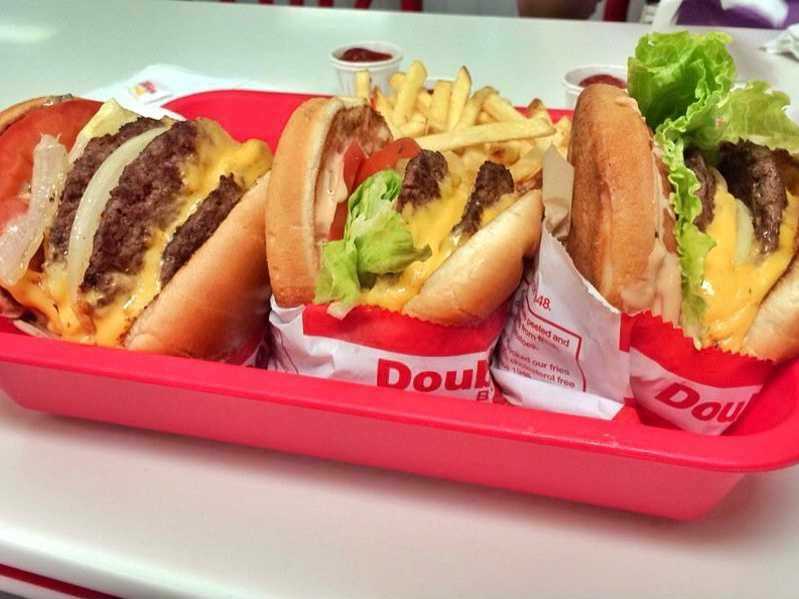 You can’t visit California without trying a double-double animal style at famed In-N-Out Burger. The classic order will get you two patties and two slices of cheese topped with extra pickles, extra spread, grilled onions, and mustard fried into each patty. Messy, but worth it. A perennial favorite of New Yorkers, Shake Shack is best known for its special ShackSauce and crinkle cut fries. Vegetarians and omnivores alike will also enjoy the ‘shroom burger: a Portabella mushroom deep fried and stuffed with cheese. With a menu ranging from a classic bacon cheeseburger to a pastrami burger known as “The Guido” (inspired by The Food Network’s Guy Fieri), this San Diego stronghold serves up the best patties in town. And for a mere $ 99, help yourself to all you can eat. There’s big flavor packed into every item at this tiny Australian café, but be sure to give the Bronte burger a try. Topped with tomato, lettuce, sweet chili, cheese, and mayo, it’s a classic that will keep you coming back. “The burgers are excellent, as are the fries and onion rings. Brunch is great with large portions and lots of options. The carrot cake French toast is amazing, the sweet potato fries are fabulous,” wrote Foursquare user Kathrine Mitchell. “After over a decade, it’s hard to beat April Bloomfield’s char-grilled burger topped with Roquefort cheese and nothing else. Save room for the shoestring fries flecked with garlic slivers and rosemary,” The New York Post wrote in a review on Foursquare. Branded as “happiness with a side of burgers,”AJ Bombers doesn’t disappoint. Starting with the Rube Goldberg-esque contraption that delivers peanuts straight to your table, right up to the joint’s signature Milwaukee burger — a 1/4 pound patty topped with cheese, bacon, and onions — there’s fun built right in. On New York City’s Upper East Side sits JG Melon, a neighborhood pub known for its famed burgers and crispy cottage fries. Stop by early for a casual lunch, and make sure you have a few bills on you, as it’s cash-only. With over 30 toppings to choose from, diners can customize their burgers again and again at The Cherry Cricket. Choices range from the expected (cheese and bacon) to the unusual (peanut butter and sauerkraut), ensuring that everyone can craft their ideal burger. At $ 28 a pop, Minetta Tavern’s black label burger doesn’t come cheap, but it’s certainly worth the splurge. Topped with caramelized onions and perfectly browned, it’s a specialty you can’t miss. “Melty cheddar and Dijon mayonnaise result in slippery, sloppy goodness. The server will ask if you’d like your burger ‘au cheval,’ (with a fried egg), which does enhance the flavor of the sandwich,” Chicagoist wrote in a review on Foursquare. Between the family-style atmosphere and plethora of burger choices (there’s over 30! ), you’ll never want to leave Casper & Runyon’s Nook. If it’s your first time, you’ve gotta try the legendary juicy nookie burger — a medium-rare patty stuffed with cheese. Not only are Hopdoddy’s unusual burgers delicious — think lamb with feta or beef topped with chili and Fritos — but most of their ingredients are locally sourced from nearby farms whenever possible. The restaurant also composts and recycles 95% of its waste, making it a top choice for the environment as well. You’ve seen America’s best burgers, now see its best fries. This entry was tagged America, Best, Burger, joints, RANKED. Bookmark the permalink.